The complete list of post-season honors for GSB fall-sport athletes will be released tomorrow, with the last of the news media outlets having finalized their selections today. Among the honorees, senior Steven Bednarsky had a particularly standout year, earning Courier News Player of the Year and Skyland Conference Player of the year. 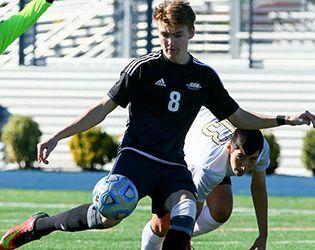 In addition, Bednarsky was named first team all-state, first team all-conference, first-team Somerset County, first team all-prep, and designated first team by the Soccer Coaches Association of New Jersey. Bednarsky has been center midfielder on the varsity squad for Gill St. Bernard’s throughout his Upper School career. During that time, he has contributed to two-state championship seasons (2013 and 2016) and posted 28 goals and 55 assists. Like most of his teammates, however, Bednarsky’s dedication to soccer began long before Upper School. In fact, his particular soccer career began at about the same time he learned to walk, possibly earlier. In addition to his dad (head coach Tony Bednarsky) and his mom (former varsity girls’ head coach Donna Bednarsky, and an All-American in college), brothers Andrew and Peter and sister Kathryn were all soccer players as well. None of that would have mattered much if he hadn’t been interested in soccer—but he was. For Steven Bednarsky, the past four years, and the past season in particular, have been the place where hard work, innate talent and great coaching came together. Bednarsky will be continuing his soccer career at Lehigh University next fall.